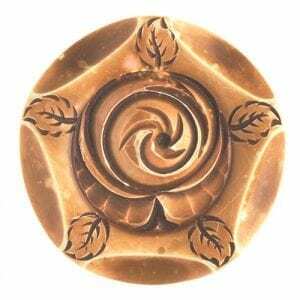 I present the variety of materials and design used during the 20th century to make buttons, in particular, buttons from casein, celluloid, bakelite, lucite and special resins. To help you understand the changes and innovations of the button industry, I provide a brief history of buttons before discussing the long continuity of natural and traditional materials such as fabric, metals and glass, and exploring the relationship of mode and fashion to society changes. They are the details of a dress and have a duel role of function and decoration. Their true importance is only really discovered with the loss of one of them. Although only a small detail of the whole style, they sometimes become more important than the whole; they can destroy the whole or give it a totally different meaning. They can serve as a mirror, a lens, or the eyes in the history of culture and dress. Unbuttoning means an exposure of a secret. Contact point of a technology with a mode. 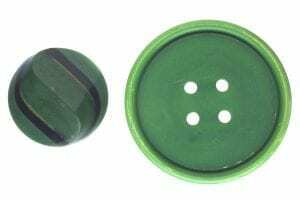 Buttons have been manufactured both as handicrafts and factory products, and thus they reflect the changing face of culture and fashion through both sides of technology. Because the button is a small object, it rapidly responds to the fashion of the times and can easily utilize the latest materials experimentally. Handcrafts in the past, factory products today. And the future ? Natural materials : horn, bone, leather, wood, bamboo, raffia, straw, nut(corozo), cork, shell (e.g. mother-of-pearl, trocas, turban, abalone, green snail, tortoise-shell), coral, pearls, precious and semi-precious stones, natural rubber etc. Artificial materials : metals (e.g. gold, silver, copper, pewter, brass, steel, aluminium, various alloy), glass, ceramics, fabric and fibers with passementerie and beads techniques, synthetic rubber, papers etc. Semi-synthetic materials : for example celluloid and galalith from milk casein. Synthetic materials : bakelite, (acrylic)lucite, acetyl cellullose, nylon, polyester, amino resin, ABS etc. Buttons designed for uniforms, from the military to sporting clubs. Memorial buttons (for example, the French Revolution or the Olympics) and coin buttons. Buttons designed for a whole range of clothing from underwear through to decorative dress. Buttons for accessories such as gloves and shoes. Motifs from human subjects, taken from mythology, children’s stories, movies, music or the circus. Motifs from nature such as the sun or the stars, or animals and plants. Artificial structures such as buildings or transportation facilities. Exoticism (Egypt, Orient, Chinoiserie, and Japonism), buttons called “realistics” depicting everyday items such as fruits, tableware, or simple tools like bolts and nuts. Geometrical designs, paisley pattern and so on. 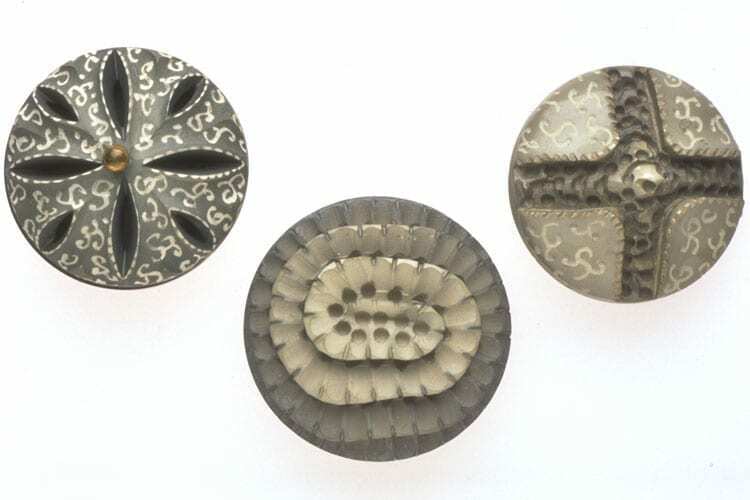 Imitation of cloth material patterns (“china calico” buttons made of ceramic are famous). Real objects(like a flower or shell) enclosed by glass or resins. 5) Variations of sizes and structures, and how they are made. Size: from large items like buttons for furs to small items like doll buttons. Structure: difference of the shank designs etc. Knotting buttons like Chinese or Korean ones. Cuff buttons and pillow case buttons that are hooked from both sides. There is even a button called a cover button which fits over another button. Note: In the Western countries, Japanese netsuke is often referred in the category of buttons. Copyright ©2018 TOMA Collection. All Rights Reserved.